This is a set of 14 stickers and badges in 4 design styles, perfect for promotional purposes for web or print. You can easily edit and customize these graphic banners with fonts, colors and shapes in Photoshop. For the dark textured vintage style, double click the “EDIT BADGE” smart object layer to edit and save your own graphics. 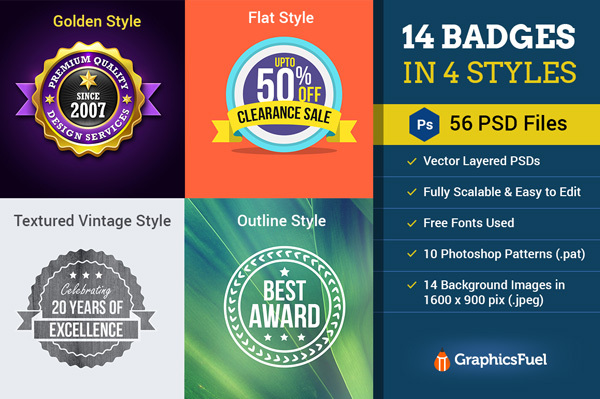 BONUS: 10 Photoshop patters (.pat file) for vintage badges and 14 different background images (1600 x 900 pixels .jpeg files) for outline style banners are included in the download. FONTS: Only Free fonts are used in the work. Font.txt with links to the fonts is included in the download.